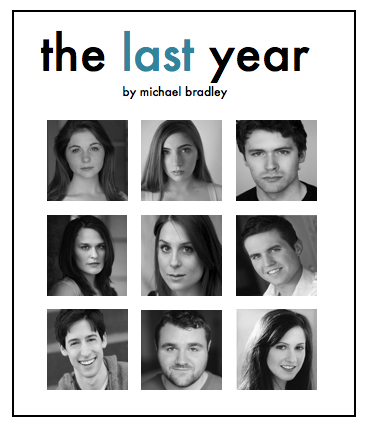 If you're free this Saturday night at 10:00pm, please join us in the premiere reading of my play The Last Year. The free reading, sponsored by PTP/NYC, will take place at the Atlantic Stage 2 on 16th Street in New York. Directed by Sean Bohan, The Last Year examines 9 classmates as they are about to embark on post collegiate life while still facing the pressures and demands of higher education. One night, one mistake, a different future. The play features an All-Star cast including Shannon Garland, Gina Marie Jamieson, Michael Kessler, Rachel Lambert, Michaela Lieberman, Preston Maguire, Alex Mandell, Collin Meath, and Laura Princiotta. Believe me, it's not to be missed, not just because I wrote it! I hope to see you there!